Trumpet and sax players perform at a previous Swing Shift concert. Islanders are invited to celebrate spring with a unique fundraising event at the Salt Spring Public Library. On Saturday, April 13, starting at 7 p.m., beloved local Swing Shift big band will set up at the circulation desk while people can “boogie among the books, mamba in the magazines, shake it in the stacks – just move however you want with big band music right in the library,” explains a press release. 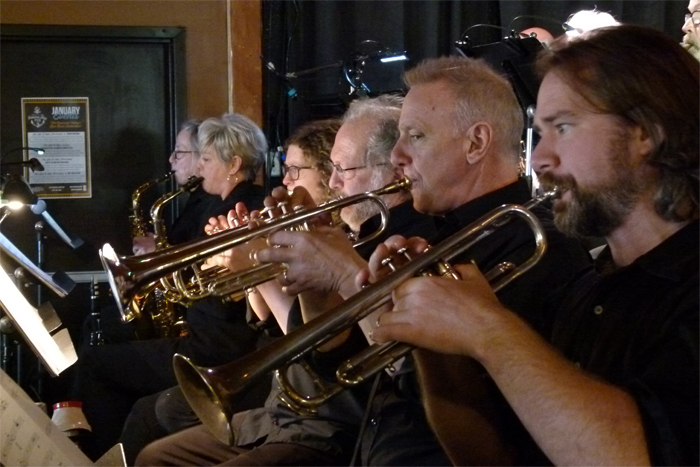 Led by music director Derrick Milton, Swing Shift plays music from the big band swing era and enhances the program with well-known Latin, pop and funk tunes. People will hear music by Count Basie, Glenn Miller, Horace Silver, Eddie Harris, Arrow, Weather Report, Benny Goodman and more. Band members will also sing a few tunes to take listeners back to the days of Frank Sinatra and Charles Trenet. “When you need to catch your breath, you can enjoy a complimentary drink and refreshments,” the library adds. Funds raised by this event will enrich the library’s collections and services, and support its ever-increasing array of free programs. Library doors will open at 6:30 p.m., with dancing from 7 to 10 p.m.
Tickets are limited and available at the circulation desk.